Meeting Between Egypt's Morsi, Judiciary Appears To Fail To Bring Compromise : The Two-Way The decree, which granted the Egyptian president sweeping power, unleashed mass protests. Today, Mohammed Morsi softened his language, but stood his ground, saying the decree will not change. 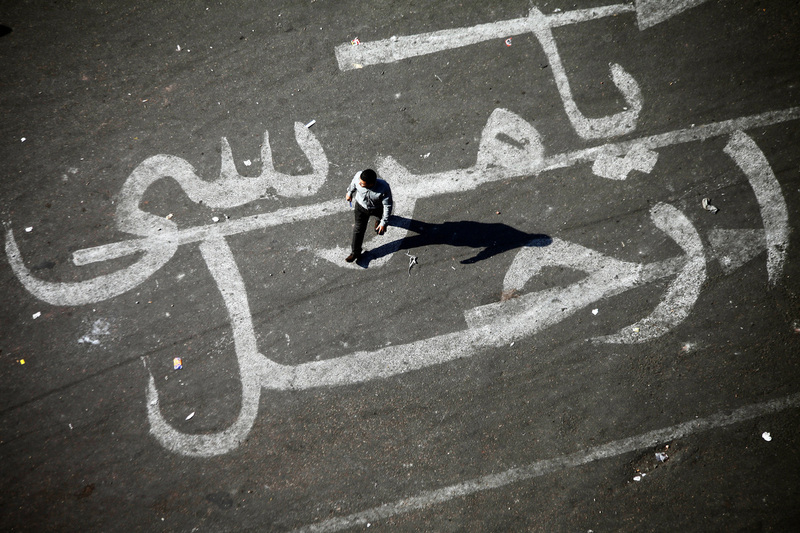 An Egyptian man walks over a graffiti reading "Morsi Go" at Egypt's landmark Tahrir square in Cairo. NPR's Soraya Sarhaddi Nelson tells our Newscast unit that despite a meeting with leaders of the judiciary, Egyptian President Mohammed Morsi has not given any signal that he is backing down from most of his power grab. A decree that essentially prohibited the judiciary from reviewing any of his decisions has brought violent demonstrations across the country from protesters who say they traded in one dictator for another. "The much anticipated meeting between Egypt's top judicial authority and Morsi failed to bring the compromise many Egyptians were hoping for. Morsi appeared to soften his decrees with vague language that legal experts found confusing. But his spokesman, Yasser Ali, also said the president's declaration from last week remained largely unchanged. "That sets the stage for a protracted showdown as a growing number of courts joined a nationwide strike. Also, Anti-Morsi protestors are planning marches and demonstrations in Cairo and other cities. "But the main Islamist groups who scheduled counter-demonstrations on Tuesday canceled them. Spokesmen for the groups say they do not want to spark violent clashes with their opponents." The New York Times has a different reading of the meeting. Quoting "a report by a television network allied with his party," the paper reports that Morsi had agreed to limit the "scope of a sweeping decree." According to the Times, Morsi's actions will be subject to judicial review but the courts will not be able to dissolve the constitutional council working on a new document. The Jerusalem Post reports that the courts will not be able to review decisions related to "sovereign" matters. It's not clear what that means. The Egyptian newspaper Ahram agrees with Soraya's reading of the situation. Morsi's spokesman is quoted as saying that there have been "no amendments made to the presidential decree" and that the "constitutional declaration will remain unchanged." The Washington Post reports that Morsi's spokesman framed the news as a "clarification" — meaning that there had been no changes to the decree, but that it only applied to "acts of sovereignty." The Post says that the softening of the language "seemed unlikely to satisfy an improbable coalition of liberal, secular forces and defenders of the autocratic rule of former president Hosni Mubarak. But it appeared to be an attempt to divide the forces arrayed against Egypt's first democratically-elected ruler."